Most LED manufacturers suggest their products to be driven using a constant current source, not a constant voltage source. This is because, using a constant voltage driving, small variations in temperature or voltage at the LEDs can cause a noticeable change in their brightness. Brightness control with voltage is also very difficult because of the non-linearity of brightness with voltage. On the contrary, the brightness is approximately linear with current, so by driving the LEDs with a known current, intensity control is linear. The controller also provides a continuous low current alignment mode (5mA to 160mA in steps of 5mA). There is a galvanically isolated synchronization input. This input can be connected directly to the system for voltages up to 24V DC. An external resistor is not necessary. There is a galvanically isolated synchronization output. This output can be used, for example, to trigger a camera or a slave lighting controller. 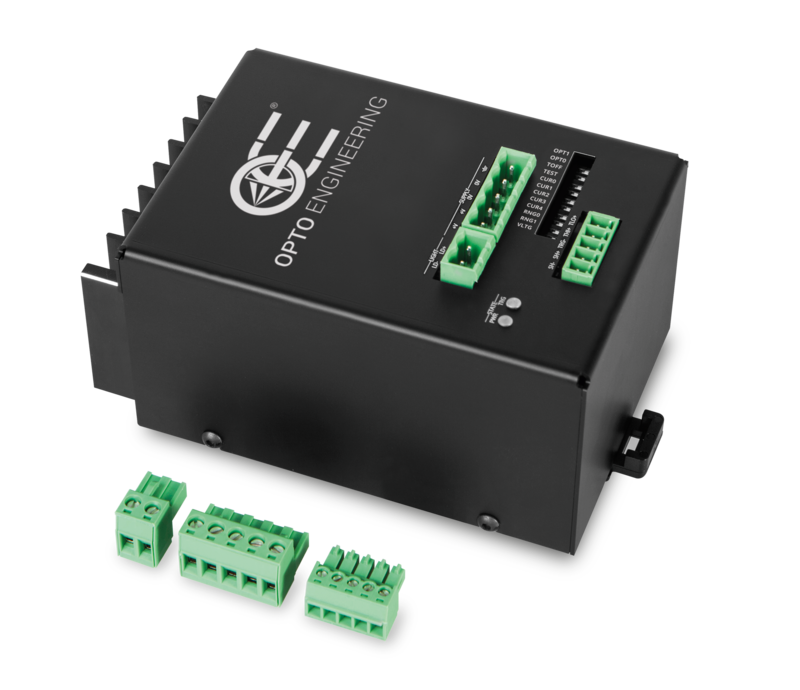 This controller features an internal digital logic to filter the synchronization input signal and to generate the synchronization output signal. An output protection circuit, used to prevent the lighting from getting overheated and thus damaged, is also included in this logic. The controller is supplied from a single 24V DC power source. The controller has an internal, user activatable, 24V to 48V DC step-up converter. This widens the range of lighting systems the controller can drive. The controller can be quickly configured using a 12-way dip switch accessible from the top panel.